Download Festival returns to Donington Park in June, delivering an almighty line up to delight true fans of rock and metal. Retaining its title year after year as the only rock festival worth mentioning, Download Festival continues to hit all the right notes for true fans of rock music. Three days of heavy rock over five stages are what await the faithful who make the journey to the iconic location every year. Previous headliners have included the likes of Marilyn Manson, Iron Maiden, Metallica, HIM, Black Sabbath, System of a Down, Tool, and Guns N’ Roses to name a few. With each year’s improvement on the last, and the organizers staying true to the Donnington ‘Monsters of Rock’ ethos, rock music certainly has a spiritual home in the shape of Download Festival. The bars stay open after the entertainment has finished, and running until 2am (Friday to Sunday) there'll be an after-hours Campsite Entertainment Zone, which has a cafe, beer stall, funfair rides, various shops, and a cinema. At Download Festival 2019 there'll be a selection of markets which will include a variety of food from around the world, as well as clothes, jewellery, massages, piercing & tattoos, organic foods, souvenirs, merchandise, and loads more. This is a festival purely for the rock enthusiasts, the loyal, and the dedicated. For those with access requirements – they can purchase a standard ticket and then for any requirements, carer passes etc they should email access@downloadfestival.co.uk. Please make sure they do not purchase a ticket for carers as we cannot refund any sales at a later point. “The application process for Download 2019 will be open in January, please refer to the website” Please email access@downloadfestival.co.uk for more information. All disabled customers are welcome at Download Festival 2019, but as it is a greenfield site there are steep stony hilly sections of the site, meaning that sometimes access across the site is not that easy especially in bad weather conditions. Please bare this in mind when booking for the event. Stewards however, will be around to assist. Live Nation provides a number of facilities in the arena and campsite to accommodate disabled customer's needs, please see the other headings on the left. Not all disabled customer's need use of these facilities but we will provide access to whatever is needed and/or a free carer/PA ticket where required to ensure your stay is comfortable and most of all enjoyable. 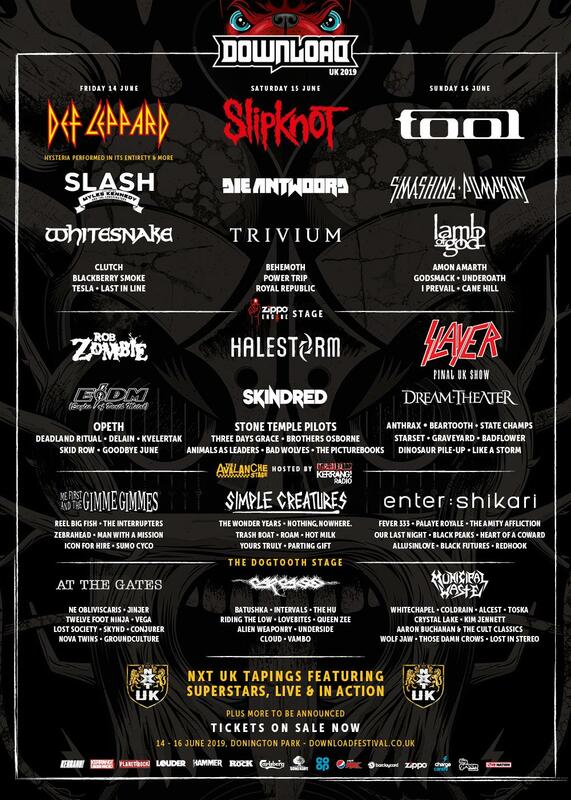 Another wave of acts joins the UK's biggest rock and metal event. Slipknot, Tool, Slash, Trivium and more feature on the initial announcement.